My dear friend Anna Guest-Jelley, founder of CurvyYoga.com, has done it again. She’s unleashed a much-needed resource that I know my fellow yogis will love! 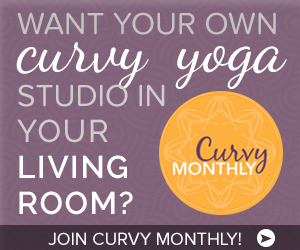 This one is called Curvy Monthly and, for less than the price of a single drop-in yoga class at most yoga studios per month, you can get over $500 worth of goods and monthly yoga resources, videos and more… all delivered to your inbox. : A new hour of online, streaming video classes (of varying lengths) — every month, for twelve months, in our mobile friendly (if that’s your thing) online studio. : A yoga pep talk from Anna (so good!) — every month, for twelve months. Yoga is essentially the art of being nice to yourself. And being nice to yourself takes practice. Stay committed, stay inspired and practice with Anna — and your Curvy Yoga family — with Curvy Monthly.